The Toyota Corolla makes an overall good impression inside and out. The Toyota Corolla has a loyal base of consumers who just love their tried and true. It is the Japanese automaker’s best-selling nameplate of all time. The latest 2017 Corolla received a slight makeover and a few new trims that include a 50th Anniversary Limited Edition. The Corolla name has been around for some 50 years, and over 40 million of them have been sold. It is a vehicle that has built a pretty solid rep for itself as a basic, trouble-free and comfy mode of transportation. The 2017 Corolla has an aggressive front end, long wheelbase, and overall innovative and very sporty look. Inside the sedan, there is a two-tiered dash with traditional buttons and dials. The infotainment system on the standard 6.1-inch or available 7-inch display has clear graphics, offers quick responses and is a tech phobic’s dream because of its ease of use. The available Entune App Suite integrates smartphone-connected services such as Bing, Facebook, Yelp and Pandora, as well as real-time traffic data, but Apple CarPlay and Android Auto smartphone app integration aren’t available. The cabin materials used are a good mix and have good quality feel. 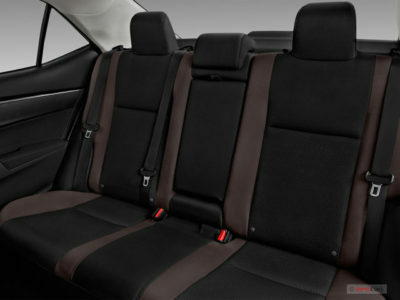 The Corolla’s seating is comfortably bolstered which translates into nice support for stressed backs. The sedan has ample room in the front and rear but as far as it being categorized as a five-seater, not so much. Two adults will not feel pinched while occupying the vehicle’s rear seat area. However, if three adults were to squeeze into the Corolla’s rear seats, you’d have to bribe them to remain! The Corolla has great visibility all around, and the seating position is strong. The Corolla’s trunk capacity is just enough for a vehicle of its size, 13 cubic feet, but the wide trunk opening really does facilitate loading and unloading. The rear seat can also split and fold down. As far as power delivery, the test vehicle, the Corolla XLE, struggled a bit during acceleration when trying to get it up to highway speeds but once there, she managed to keep up. And speaking of power, a 132 horsepower, 1.8-liter, 4-cylinder engine provides the Corolla’s forward momentum. Even though the sedan is not quick, the power that is delivered feels reliable and solid. The steering wheel feels weighty, so the vehicle felt a bit hefty, but it did not take away from its overall commuter comfy drive. Safety-wise, all of the Corolla’s seven trims come equipped with a rearview camera and the Toyota Safety Sense package, which includes, pre-collision system with pedestrian detection, automatic high beams, automatic emergency braking, lane departure alert, dynamic radar cruise control, lane tracing assist and dynamic radar cruise control. 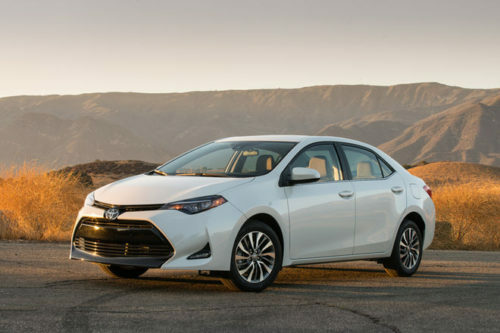 Depending on the transmission, the 2017 Corolla earns 27-28 mpg in the city and 35-36 mpg on the highway. The fuel-efficient Corolla LE Eco model gets up to 30 mpg in the city and 40 mpg on the highway. All things considered, the 2017 Toyota Corolla gets the job done. It makes an overall good impression inside and out and is for buyers who are seeking quality, comfort, and value. On these fronts, the Corolla delivers in spades as being just pure and on-point. Previous articleCan you save your ‘strictly business’ love relationship?